Don’t have much time but hate to miss out on Panama’s tropical paradise? This Bocas del Toro one-day tour is for you. Our provider picks you up at your hotel early in the morning and takes you directly to the border of Costa Rica and Panama. Once you cross the border, your guide will drive you to Almirante. From there, it’s a 30-minute boat ride to Bocas on the main island. From Bocas you will start cruising the Bocas del Toro archipelago and enjoy its natural beauty. We offer two different options! 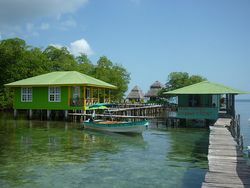 Both including snorkeling at top spots and visiting some top locations of Bocas del Toro. This tour will first take you to Dolphin Bay. Here, you’ll have the chance to observe dolphins in their natural environment. Then you will head to Cayo Coral to snorkel and discover the fascinating underwater world of the archipelago. Finally, the tour will take you for a visit to the Red Frog Beach Reserve before heading back to Costa Rica. First we will visit bird island to watch different kinds of birds arriving to the island. After about 20 to 30 minutes you head on to Boca del Drago. Here, you will order lunch and take a stroll along the beach before eating. The final stop is Star Fish Beach where you can observe large starfishes. This beach is also an amazing spot for snorkeling. You are going to have about 2 hours to enjoy this lovely beach! Please note: this Bocas del Toro one-day tour is not for everybody! Although Panama is our neighboring country, tourism has a different feel than in Costa Rica. The weather can also play a role in operating this tour. Puerto Viejo is three hours from Bocas del Toro and weather conditions can change quickly. Safety is the primary concern of the tour operator, and they reserve the right to modify the tour itinerary and places visited. If this is the case, no refund will apply. Includes: Transportation, tour according to the option selected, lunch, snorkeling equipment, during the tour cooler with ice and 2 drinks per person (water or soda). Not included: Border crossing fees (calculate another $8 for round trip), $5 entrance fee at Red Frog Beach (Touch of Nature), additional transportation charges apply for hotels outside of Puerto Viejo: Playa Chiquita $10, Punta Uva $15, Manzanillo or Cahuita $20 (per booking). Breakfast is not included and we recommend you ask for a breakfast box at your hotel.